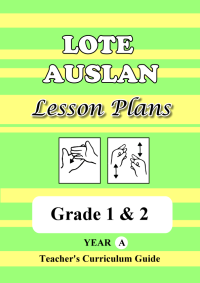 The LOTE Auslan Lesson Plans - Grade 1 & 2 (Year A) e-book is a 163 page PDF and comes with a downloadable video. It is a time saver for LOTE Auslan teachers as it consists of lesson plans for the whole year - four terms, ten lesson plans per term (a total of 40 lesson plans). Each lesson has pleasant, easy-to-follow step-by-step instructions for LOTE Auslan teachers to follow, with sheet handouts for students. The downloadable Auslan signing video shows you how the signs in each lesson are actually signed out. The signs in the e-book and video are from the Victorian state, signs all around Australia are generally the same except for a few, especially colours. If you are from a state other than Victoria, please double check the signs that they are the same that your state use. There is also a free Auslan Picture Dictionary Video viewable in this website where you can check how other frequently used signs are being signed out (the video uses Victorian signs). The LOTE Auslan Lesson Plans - Grade 1 & 2 (Year A) e-book and video is copyright and for personal and school classroom use only. The e-book is to be printed only once its entirety per individual/teacher and the individual/teacher may photocopy the e-book as many times for personal and classroom use. Please do not photocopy or reprint the e-book or video to be distributed to other individuals or teachers, please direct them to this website instead. For Individual Auslan Teachers and/or Companies - if you would like to use e-books and videos from Auslan Resources as part of your Auslan teaching business, for example, teaching private Auslan classes or community Auslan classes, please contact me for permission and special deal discounts.